I’m Marion and I am a professionally trained dog groomer. The reason I started Mucky Pups was because I rescued a poodle 17 years ago and the only time I could get to a dog groomers was a Saturday. The first groomers I tried did a very severe cut which gave the dog clipper rash. When I phoned back for another appointment I asked that the dog not be cut so short to be informed that was the style and that was that! With that I found myself another groomers, my only complaint being that being a Saturday appointment I would have to drop off at 9am and the pickup time was 6pm! I found this far too long as an average cut takes 2 hours. This meant the dog was caged whilst not being worked on. The other thing I found with the groomers I visited was that you could not see in the windows or past the reception when on the premises. One year later I was made redundant as a book-keeper so used the money to train and then open up my own double fronted shop. The windows were left clear and reception was on half level basis. 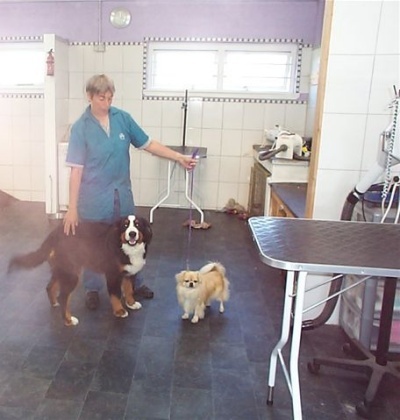 Each dog came in for his/her individual appointment averaging 2 hours. 16 years later I still feel this is the best policy for me. I also used to show & breed Tibetan Spaniels but as the business got busier the shows got fewer, my last championship show was about 2½ years ago. I now have a new puppy (Bernese Mountain dog) so am now back showing. When not dog grooming I enjoy working on the croft with the livestock.